Most people treated with tuberculosis can recover from the disease without any permanent damage. 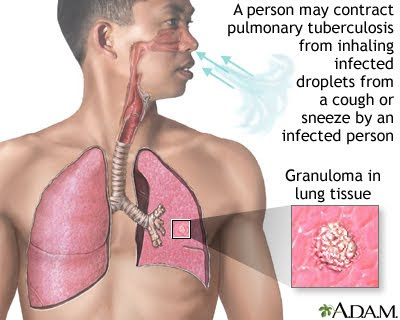 Pulmonary Tuberculosis (TB) is a contagious lung disease caused by bacterial infection. TB is an infection that is primarily in the lungs and does not spread to other tissues or organs. TB is caused by Mycobacterium tuberculosis (M. tuberculosis). It is a bacteria that travels through air droplets from a cough or sneeze of a person who has TB. A TB infection may lay dormant for years and can stay inactive although for some, it can reactivate into full blown tuberculosis. Treatment of tuberculosis involves curing the infection. This calls for a combination of drugs to be taken by the patient. The most commonly used medication are Isoniazid, Rifampin, Pyrazinamide, and Ethambutol. For decades before antibiotics became generally available, sunshine was used to treat tuberculosis, with patients often being sent to Swiss clinics to soak up the sun's healing rays. Now, for the first time scientists have shown how and why heliotherapy might, indeed, have made a difference. A study led by researchers at Queen Mary, University of London, conducted in collaboration with the Medical Research Council's National Institute for Medical Research, has shown that high doses of vitamin D, given in addition to antibiotic treatment, appear to help patients with tuberculosis (TB) recover more quickly. The research, which will be published online this week in the Proceedings of the National Academy of Sciences of the USA (PNAS), is the first to investigate the effect of vitamin D on the immune responses of patients receiving treatment for an infectious disease. The findings indicate that high doses of the vitamin can dampen down the body's inflammatory response to infection, enabling patients to recover faster, with less damage to their lungs. In addition to stimulating recovery in TB patients, the authors say their results suggest that vitamin D supplementation might help patients recover better from other diseases such as pneumonia. Dr Adrian Martineau, senior lecturer in respiratory infection and immunity at the Blizard Institute, part of Queen Mary, University of London, who led the research, said: "These findings are very significant. They indicate that vitamin D may have a role in accelerating resolution of inflammatory responses in tuberculosis patients. This is important, because sometimes these inflammatory responses can cause tissue damage leading to the development of cavities in the lung. If we can help these cavities to heal more quickly, then patients should be infectious for a shorter period of time, and they may also suffer less lung damage. "More broadly, the ability of vitamin D to dampen down inflammatory responses without compromising the actions of antibiotics raises the possibility that supplementation might also have benefits in patients receiving antimicrobial therapy for pneumonia, sepsis and other lung infections." Dr Martineau and his colleagues from a number of London hospitals and institutions randomised 95 TB patients receiving standard antibiotic treatment into two groups: for the first eight weeks of their treatment, 44 received additional high dose vitamin D, while 51 received a placebo. Dr Anna Coussens at the MRC's National Institute for Medical Research measured levels of inflammatory markers in blood samples taken from these patients, and conducted statistical analyses to determine the effects that vitamin D had on the immune response. "We found that a large number of these inflammatory markers fell further and faster in patients receiving vitamin D," said Dr Coussens. The researchers also found that Mycobacterium tuberculosis, the bacterium that causes TB, was cleared from the patients' sputum (the phlegm coughed up from deep in the lungs) faster in those who were taking vitamin D, taking an average of 23 days to become undetectable under the microscope compared to 36 days in the patients who were taking the placebo. Dr Martineau said it was probably too early to be recommending that all TB patients should take high-dose vitamin D in addition to the standard antibiotic treatment for the disease; more research with more patients was needed before clinical recommendations could be made. "We are hoping to do more work to evaluate the effects of higher doses and different forms of vitamin D to see if they have a more dramatic effect," he said.